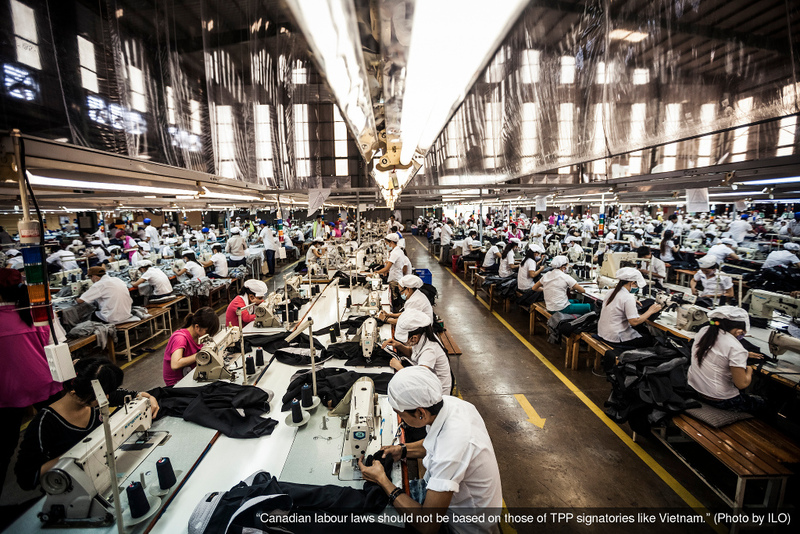 The Trans-Pacific Partnership, whose full text was made available to the public yesterday after years of secret negotiations, includes provisions to harmonize Canadian labour laws with those of countries with inferior labour standards, reduce the ability of our government to purchase Canadian-made products, undermine Canada Post, and increase corporate access to exploitable labour, according to the Alberta Federation of Labour. The section of the deal on Canada Temporary Entry for Business Persons confirms fears that the deal allows foreign companies to bring in an unlimited number of temporary foreign workers in certain broad occupational categories without work permits, bypassing all certification requirements and rules to protect Canadian jobs, according the AFL. The group warned that this will continue to distort the local labour market and to displace Canadians and to drive down wages. The deal requires that all foreign companies be treated exactly the same as Canadian ones, even if those companies are run unethically in jurisdictions with lower environmental and humanitarian standards, the AFL added. The deal additionally reduces the ability of Investment Canada to regulate foreign investment in Canada by increasing thresholds for review up to $1 billion, including takeovers, the group warned. AFL warned that companies will be able to sue member governments for any regulation they provision which might impact their profits, while the section of the deal on labour rights contains virtually no meaningful guarantees on minimum labour or employment laws besides that they must exist. Prime Minister Justin Trudeau’s new Liberal government promised today to hold a “full public debate” before ratifying the deal negotiated and agreed in principle by former PM Stephen Harper’s Conservative government. Any government which signs this pact, is obviously not working in the interest of Canada. And in my opinion will loose all legitimacy by doing so. If you are aiding in our enslavement you are not our government, but an occupying hostile force. The TPP is a perverse means to undermine the authority of sovereign nations by multinational corporations and as such should be consigned to the closest incinerator. If it gets accepted and signed by the Canadian Government then we all might as well bend over and apply some grease to ease the pain. TO JUSTIN TRUDEAU: PLEASE HAVE THE COMMON SENSE TO KILL TPP.